Maybe the Mainstream Media is finally getting the message. As I reported on Thursday, NBC actually aired a piece on the their Nightly News about a new report from U.S. 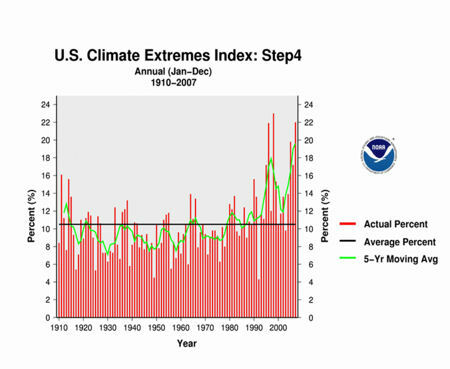 Climate Change Science Program linking Climaticide to extreme weather events. Then yesterday Syndicated columnist, Amy Goodman, had a piece in the Seattle Post Intelligencer called Flooding is global warming at work in which she took the Mainstream Media to task for their failure to connect the dots in their reporting on extreme weather events and Climaticide. Double score here. Goodman reports on the link between Climaticide and extreme weather and criticizes the MSM for acting as if the connection does not exist. So if the disasters that follow one another, from hurricanes to tornadoes to flooding, are consistent with global warming, why aren’t the networks, the weather reporters, making the link? According to Dr. Heidi Cullen of The Weather Channel it’s because most meteorologists don’t understand climate science, which is true as far as it goes. But meteorologists don’t normally make programming decisions. Those decisions are made by producers, station managers and station owners. To really understand the MSM’s failure to report on Climaticide see Ross Gelbspan’s books, The Heat Is On: The Climate Crisis, The Cover-up, The Prescription and Boiling Point: How Politicians, Big Oil and Coal, Journalists, and Activists Have Fueled a Climate Crisis–And What We Can Do to Avert Disaster. MJ.com: As you mentioned, you came across some of the deniers’ links to the coal industry. Can you talk more about that story and what you found out? RG: I had done an article on the impact of climate change on public health in the Washington Post. After that piece ran, I got letters from readers who said, “Well, this is all well and good but we still don’t believe the climate is changing.” These letters referred me to the work of three prominent greenhouse skeptics: Fred Singer, Patrick Michaels, and Richard Lindzen. I read their work and I was persuaded that this issue was stuck in uncertainty, that there may not be a story here at all. But I had set up interviews with several other scientists and as a courtesy I decided to go ahead and keep those interviews. One of the scientists, who is a co-chair of the Intergovernmental Panel on Climate Change, showed me how these skeptics were being misleading in how they were manipulating data and really presenting a false picture. It really turned my head around. That scientist also said to me, “We’re puzzled because we don’t know where these folks are getting funded from. They’re not getting funded from the traditional public science funding sources.” I learned shortly thereafter that there was going to be a public hearing in Minnesota that was going to review the environmental impacts of coal burning. I found out that the fossil-fuel lobby was flying in four experts to testify. [At the hearing] the assistant attorney general compelled all these witnesses to disclose all their funding sources under oath. At that point, I realized that the coal industry had paid at least three of these greenhouse skeptics about $1 million over a three-year period. That propelled me to dig some more. Goodman concludes her op-ed with a story about Ralph Nader’s grandmother and George Bush’s grandfather and then issues a (sort-of) call to arms. I’m glad to have Goodman addressing this issue and pleased that she has has called for some sort of public action, but I don’t think she’s being forceful enough. Opposition in Congress and the gas and oil industries (which are virtually one and the same) keeps meaningful policies from being adapted. It also deludes the public into thinking that Climaticide is a minor problem, less important than the unemployment rate. The Media cowed by corporate sponsors whose advertising they fear to lose evades drawing the correct conclusions from the events they report. They provide the details and none of the context, telling us about killer tornadoes in Atlanta, crashing salmon fisheries in California and Oregon, droughts in the Southwest and floods the Midwest without ever mentioning climate change. At this point I see no alternatives to mass protests and civil disobedience. The sort of things that get the attention of the people who don’t normally pay attention. I’m calling for civil disobedience outside of coal-fired power plants or whenever new coal-fired power plants are to be built, chaining ourselves to fences, bulldozers etc. Protests outside of government and corporate offices, including the offices of the media. Sometimes we might, peacefully, occupy those offices and refuse to leave until we get answers to our questions and commitments to act upon our demand. I would start with the major television media, insisting that the connect the dots when reporting on climate and that they investigate the relationship between professional denialists and the oil and gas companies, which fund them. Yes, we’ll make some people angry and some of us will spend a night in jail or pay a fine, but if we do this on a large enough scale we will make it impossible for the public to ignore this issue and, most importantly, the URGENCY of the issue. We can continue to use our keyboards and the Internet to protest and organize, but we also need to get up from our keyboards and rally, loudly, in the streets. It won’t be comfortable to do this, but if we do we will not have to recriminate ourselves as we sweat in 130 degree heat for what we did not do. As a small step in getting the MSM’s attention I would encourage you to sign Climaticide Chronicles’ petition to the MSM demanding that news on Climaticide and extreme weather events be reported in the proper scientific context. Thanks.